Skipping lunch: One of the best-kept secrets for lunch will go out with the new year. Lissa Doumani and Hiro Sone, proprietors of Ame (689 Mission, at Third Street) in the St. Regis Hotel, have decided to stop serving lunch. Ame will join its sister restaurant, Terra, in St. Helena, as a dinner-only destination. “We just don’t do lunches well,” said Doumani, ceding to the great established truth of restauranting — which is that you don’t make money at the noontime meal. Well, I agree with Lisa that they don’t do lunches well. The best things to order are from the sashimi bar. When you go to their main menu, the kitchen just doesn’t deliver. Service was haphazard, mainly handled by bussers who were clueless. 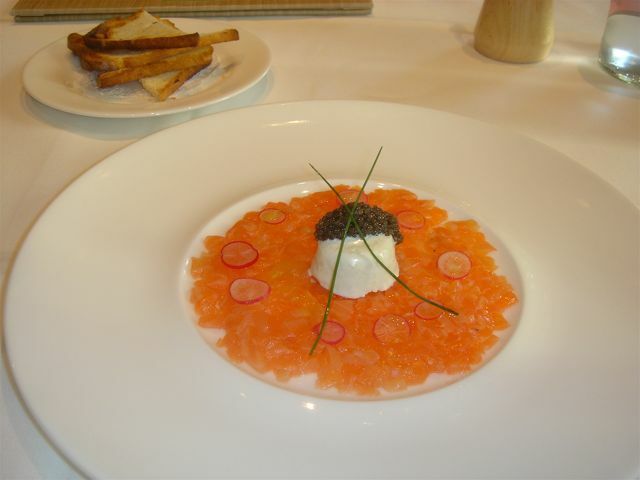 Tartare of lightly smoked Tasmania Ocean trout with wasabi panna cotta and American sturgeon caviar. The trout was handled as rough dice. The wasabi panna cotta was superb, adding a great spicey “bite” to the dish. Tempura “Poke” wrapped in Ogo seaweed, Hawaiian Sea Salt and thin slivers of green onions and threads of daikon. After much prodding, our server thought that the fish was hamachi, tuna and sea bream. 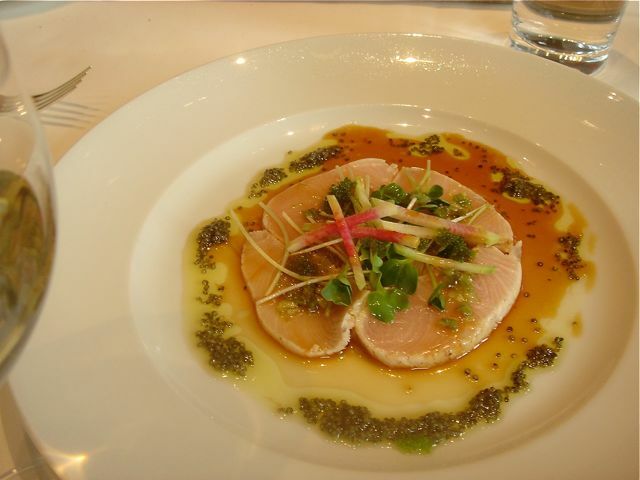 Sashimi of Hamachi with pickled wasabi leaves, mountain caviar, daikon sprouts and ponzu. The mountain caviar were the small beads ringing the plate. I asked exactly what was mountain caviar and was told that they were the seeds from the Broom Cypress Tree from China. Who knows??? Excellent, although there was a bit too much ponzu. 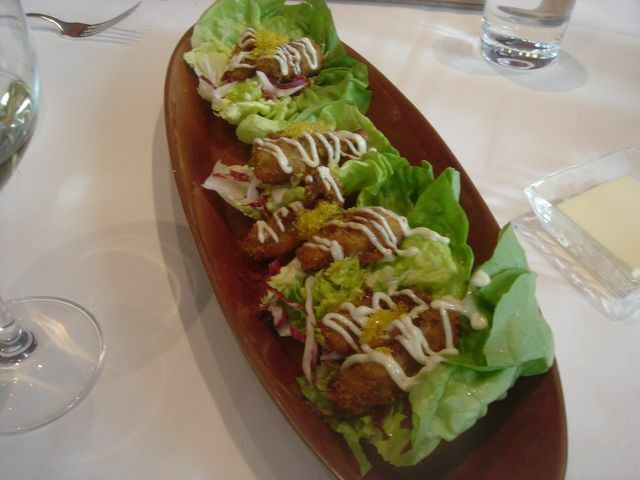 Panko Crusted Miyagi Oysters in lettuce cups with yuzu mayonnaise. Why or why is there so much lettuce? We deep-sixed the lettuce and ate just the oysters. 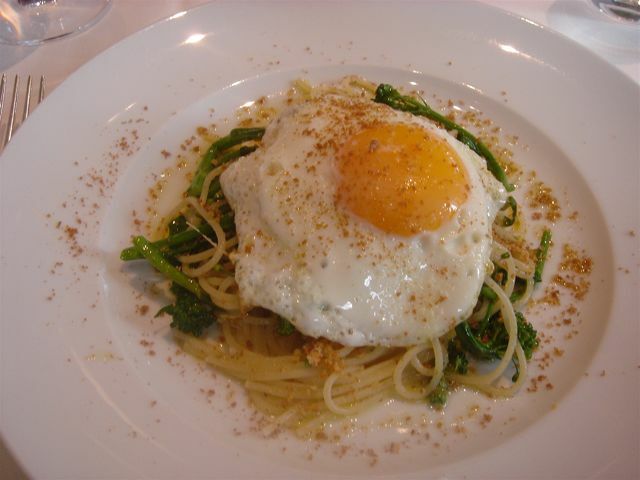 John: Spaghetti with bottarga, broccoli di Ciccio, chilies, and a fried organic egg – John asked how spicy was this dish and was assured it was very mild. Well, it was so spicy that John managed to just eat the egg. 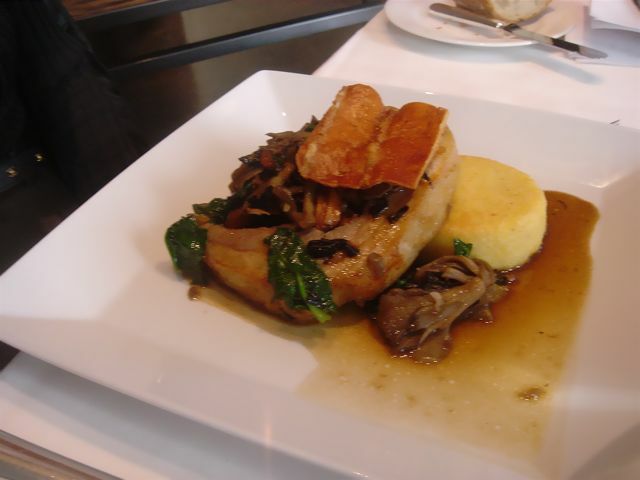 Me: Porchetta with polenta cake and forest mushroom sauce – the porchetta was dry and so overcooked that one bite was enough. 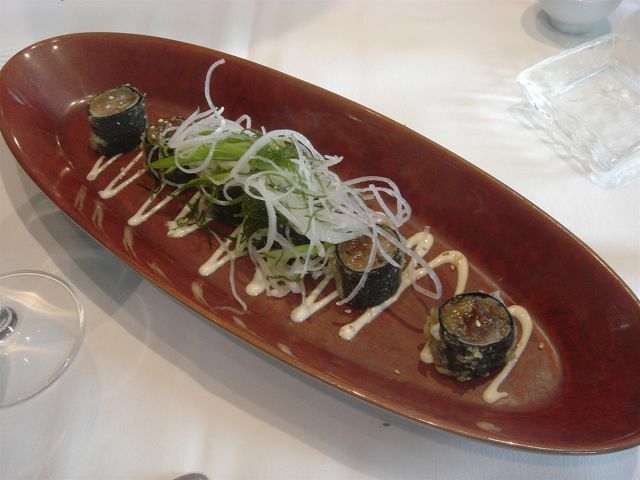 I would love to try the Chawan mushi dish, but at the time, it wasn’t on the lunch menu.